Barack Obama's assistant for Homeland Security and Counterterrorism, John O. Brennan, conveniently outlined the administration's present and future policy mistakes in a speech on August 6, "A New Approach for Safeguarding Americans." John O. Brennan, Barack Obama's assistant for Homeland Security and Counterterrorism. To start with, his address to the Center for Strategic and International Studies in Washington, has an unusual tenor. "Sycophantic" is the word that springs to mind, as Brennan ninety times in five thousand words invokes either "President Obama," "he," "his," or "the president." 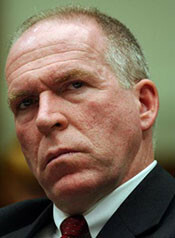 Disturbingly, Brennan ascribes virtually every thought or policy in his speech to the wisdom of the One. This cringe-inducing lecture reminds one of a North Korean functionary paying homage to the Dear Leader. Specifics are no better. Most fundamentally, Brennan calls for appeasing terrorists: "Even as we condemn and oppose the illegitimate tactics used by terrorists, we need to acknowledge and address the legitimate needs and grievances of ordinary people those terrorists claim to represent." Which legitimate needs and grievances, one wonders, does he think Al-Qaeda represents? Brennan carefully delineates a two-fold threat, one being "Al-Qaida and its allies" and the other "violent extremism." But the former, self-evidently, is a subset of the latter. This elementary mistake undermines his entire analysis. He also rejects any connection between "violent extremism" and Islam: "Using the legitimate term jihad, which means to purify oneself or to wage a holy struggle for a moral goal, risks giving these murderers the religious legitimacy they desperately seek but in no way deserve. Worse, it risks reinforcing the idea that the United States is somehow at war with Islam itself." This passage regurgitates a theory of radical Islam that, according to Lt. Colonel Joseph C. Myers of the U.S. Air Command and Staff College, "is part of a strategic disinformation and denial and deception campaign" developed by the Muslim Brotherhood. Discredited in 2007 by Robert Spencer, the theory distinguishes between good jihad and bad jihad and denies any connection between Islam and terrorism. It's a deeply deceptive interpretation intended to confuse non-Muslims and win time for Islamists. The George W. Bush administration, for all its mistakes, did not succumb to this ruse. But Brennan informs us that his boss now bases U.S. policy on it. The speech contains disquieting signs of ineptitude. We learn that Obama considers nuclear weapons in the hands of terrorists to be "the most immediate and extreme threat to global security." Fine. But how does he respond? With three feeble and nearly irrelevant steps: "leading the effort for a stronger global nonproliferation regime, launching an international effort to secure the world's vulnerable nuclear material …, and hosting a global nuclear summit." Nor can Brennan think straight. One example, requiring a lengthy quote. "Poverty does not cause violence and terrorism. Lack of education does not cause terrorism. But just as there is no excuse for the wanton slaughter of innocents, there is no denying that when children have no hope for an education, when young people have no hope for a job and feel disconnected from the modern world, when governments fail to provide for the basic needs of their people, then people become more susceptible to ideologies of violence and death." Summary: Poverty and a lack of education do not cause terrorism, but a lack of education and a job make people more susceptible to the ideas leading to terrorism. What is the distinction? Woe on us when the White House accepts illogic as analysis. Further, let's focus on the statement, "when governments fail to provide for the basic needs of their people, then people become more susceptible to ideologies of violence and death," for it contains two stunning errors. First, it assumes the socialist fiction that governments provide basic needs. No. Other than in a few commodity-rich states, governments protect and offer legal structures, while the market provides. Second, every study on the subject finds no connection between personal stress (poverty, lack of education, unemployment) and attraction to radical Islam. If anything, massive transfers of wealth to the Middle East since 1970 contributed to the rise of radical Islam. The administration is basing its policy on a falsehood. Where, as they say, is the adult supervision? Implementation of the inept policies outlined by Brennan spells danger for Americans, American interests, and American allies. The bitter consequences of these mistakes soon enough will become apparent. Some of the consequences became apparent in the administration's handling of Christmas Day bomber Umar Abdulmutallab. After an interrogation lasting some 50 minutes, Abdulmutallab was provided with Miranda warnings and a lawyer, after which Abdulmutallab clammed up. According to Eric Holder, all was well. The administration was following hallowed procedures. Last week the administration let it be known that all that was well was now even better. Abdulmutallab was talking again. Did he waive his "rights"? The administration has not seen fit to apprise us of all the circumstances leading to Abdulmutallab's widening his circle of love beyond his lawyer. In January the administration sent Brennan out to defend it on FOX News Sunday. Before his appearance, the Washington Post had reported that "the normally reclusive Brennan is scheduled to appear on several Sunday TV talk shows." Following his appearance, Paul Mirengoff wrote, we now have a pretty good idea of why Brennan is "normally reclusive." By departing from his norm, Paul observed, Brennan showed himself to be a hack who undermined any lingering confidence that the Obama administration had a clue about how to fight terrorism. Paul was particularly impressed with Breannan's statement, in response to a question about what the downside might be to treating Abdulmutallab as an enemy combatant, that "there are no downsides or upsides in particular cases." I explained to them that [Abdulmutallab] was in FBI custody, that Mr. Abdulmutallab was, in fact, talking, that he was cooperating at that point. They knew that "in FBI custody" means that there's a process then you follow as far as Mirandizing and presenting him in front of a magistrate. None of those individuals raised any concerns with me at that point. They didn't say, "Is he going into military custody?" "Is he going to be Mirandized?" They were very appreciative of the information, we told them we'd keep them informed, and that's what we did. So there's been a--quite a bit of an outcry after the fact where, again, I'm just very concerned on the behalf of the counterterrorism professionals throughout our government that politicians continue to make this a political football and are using it for whatever political or partisan purposes, whether they be Democrats or Republicans. Brennan implied that his Republican interlocutors should have concluded from his statement that Abdulmutallab was in custody and was cooperating that he would be given a Miranda warning and a lawyer. A reasonable person would not draw any such conclusion, however, and in fact Brennan's interlocutors did not. Brennan angrily asserted that he was "tiring of politicians using national security issues such as terrorism as a political football. They are going out there, they're, they're unknowing of the facts, and they're making charges and allegations that are not anchored in reality." If Brennan is tired, his lassitude must derive from his own exertions in political football. May 19, 2010 update: In a video of a speech posted today, presumably given to an Arab-American audience, John Brennan discusses his own biography with quite a few points of interest, complete with a quite passable section in which he speaks Arabic. But most informative is this sentence: "I marveled at the majesty of the hajj and the devotion of those who fulfilled their duty as Muslims by making that pilgrimage." Given that only Muslims may enter Mecca and its surrounding areas, where the hajj takes place, this clearly but discreetly implies that Brennan is a convert to Islam. Mar. 8, 2013 update: In a highly unusual move, John Brennan was sworn in as director of central intelligence today on a 1787 draft of the U.S. Constitution. Some have piquantly noted that that this draft lacks the Bill of Rights. True, but for me the point has more to do with Brennan not wanting to give his religion away by using a sacred scripture. 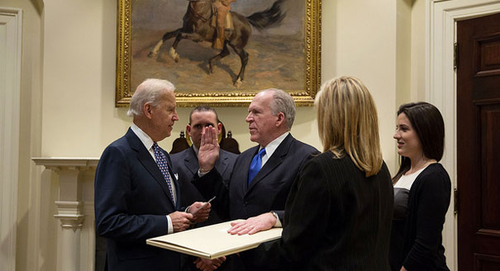 Joe Biden swearing in John Brennan away from the public eye, with a draft Constitution as scripture.